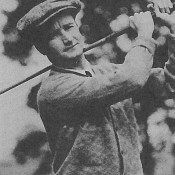 Jerry Travers, who was born in New York City, is considered not only the first great New Jersey amateur golfer, but was also considered the finest American amateur golfer in the days before Bobby Jones. He played out of Montclair Golf Club, and later Upper Montclair Country Club. Travers was not only the first to win the State Amateur four times -while making the final six times in a row between the years 1907-13 (he did not enter in 1909) - but the first to win five Metropolitan Amateurs, and four U.S. Amateurs. Bobby Jones is the only other golfer to win more than three U.S. Amateurs. His greatest victory, the 1915 United States Open, made him the second amateur, after Francis Ouimet in 1913, to win the U.S. Open when he grinded out a score of 297 at Baltusrol. Travers was inducted into the World Golf Hall of Fame in 1976.